I was commissioned to finish an already started cross stitch for a lady and do half of another one that isn't even started yet. When she dropped off the patterns the one that is started didn't have its cover image anymore so I looked on the internet so I could have a color diagram as well as the black and white copy. The first one has to be done in the next 1 to 2 months as you can see all that is done is part of the little elephant it has a long ways to go to say the least. 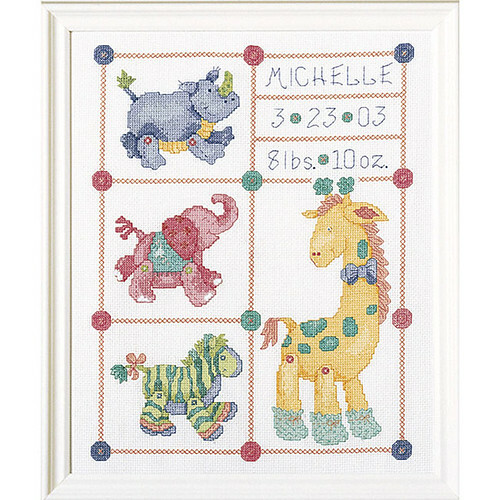 "Jungle Babies" Birth record 43221 Plaid company Bucilla. This is what it needs to look like when done not my work. This is a discontinued pattern as far as I can tell. This is the second one I need to do half of. This way she is able to finish it and can tell her children and grandchildren that grandma made it. Not exactly wrong in that she will have worked on both items. But they do not need to know about my part in things do they. Theses things are always nicer and more sentimental to a person if made by grandma and she will have made parts of both of these. She got in over her head when the first grandchild was born she made one and stated she would do it for every grandchild and she also agreed to make one for every wedding of her own children. 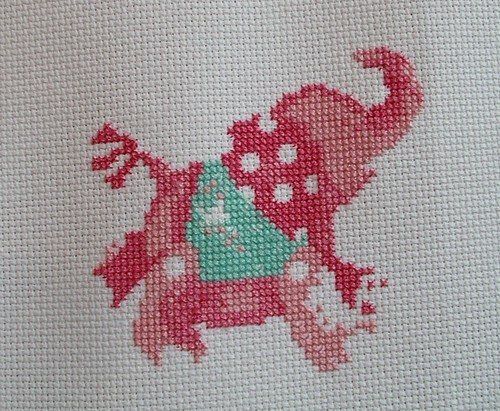 She is currently doing a wedding one and is two years behind on the elephant and the other baby one. So hopefully she will be all caught up soon and the family will be none the wiser. My kids have seen me buy half done projects at thrift stores and finish them for us to keep. They love them all the same. In our opinion better to finish someone else-es work than to let it get tossed in the garbage and no one enjoy it. This photo is from Coloray's website. So if you want to make one you can go there and get a kit. I crosstitched for years and have found a lot more satisfaction in crochet. The second crosstitch is going to take the most time I think. Good luck with them. Help with damaged old sweater ?